Kinsey had been plotting for a long time how she was going to come out to the world. She quietly came out to her parents when they brought up the topic of sexuality, then used a witty Instagram caption to come out to the world. I think I wanna come out on Instagram today... Imma be like "a year ago today I found out I'd be able to get married in my own country"
Last weekend, her parents told her that they wanted to throw a 4th of July party. They sent her to the mall with a friend, and when she returned, she found the most amazing surprise. She told BuzzFeed News that she was shocked to return home to rainbows everywhere. The whole time she thought her parents were planning a party celebrating the nation's independence, when really they were celebrating her newfound freedom of identity. 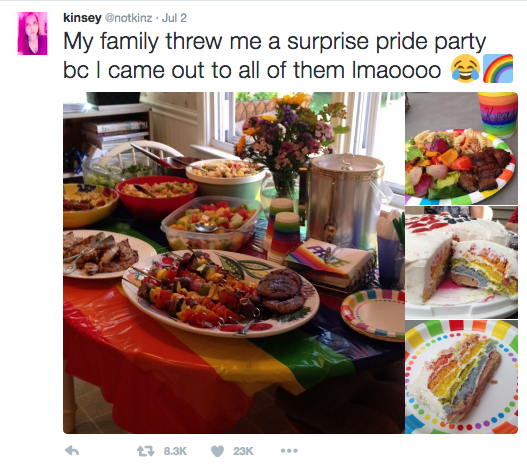 Kinsey said that people have loved hearing about her party and they have shared their own stories of coming out with her. "I love being a part of such a caring and awesome community," she told BuzzFeed News. "The best part is seeing how happy the party has made everyone." She added how important it is to have pride in your identity, especially in the wake of the Orlando shooting. It's remarkable what power having supportive parents can have on someone.